Atari 5200 Cart. 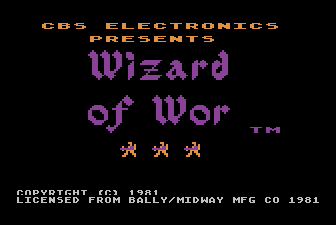 published 36 years ago by CBS, Inc.
Wizard of Wor © 1983 CBS, Incorporated. The object of WIZARD OF WOR is to accumulate points by destroying the Worlings you encounter as you pass through numerous dungeon mazes. Bonus points are allotted for successfully battling the Worluck and the Wizard himself. In the two-player version you can work with or compete against another Worrior commander. * In the early dungeons, Worlings will remain slow for a longer period of time than in later dungeons. Therefore, it is to your advantage to get your Worrior into the dungeons as fast as possible and blast away Worling after Worling before they speed up.